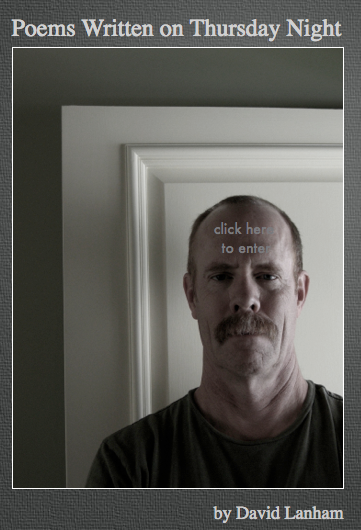 Profile Response: David Lanham, Austin, TX | How Will We Live Tomorrow? Sometimes I have the uncanny good fortune to land in a city and discover my host is a perfect reflection of the place I’m visiting. In his initial e-mail to me, David Lanham said, “Austin is the living embodiment of the most ominous and wonderful trends in American culture.” In many ways, David Lanham is the living embodiment of Austin, and the dissonance between its funky image and affluent reality. David is a musician and a poet. 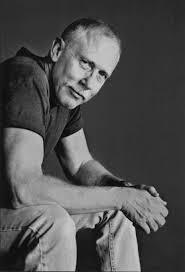 He studied writing at the famous Interlochen high school in Michigan and Beloit College. He was a musician in New York City, owned an array of guitars, had a penchant for his pedal steel instrument, wore skinny jeans and cowboy boots, but got tired of endless rent. He decided to move, “as far South as I needed until people stopped asking me what a steel guitar was.” He landed in Austin in 1995 and bought a bungalow south of the river. Dave reports that 120 people move to Austin every day. Few leave. “A person can move here from a Palo Alto, sell a $1.2 million ranch, buy a $600,000 McMansion, and live like a king.” Austin accommodates its newcomers through sprawl. 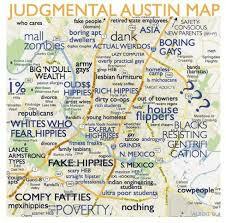 “Austin has an absolute primacy of neighborhood associations. They suppress zoning changes and therefore density. 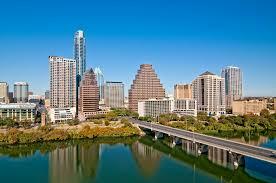 After meeting Dave, and spending four days in Austin, his insights on his adopted city rang true. I also had an opportunity to read some of his poetry. I disagree with him on that point. Much of it is profound. “As a people, we will live far more economically separated. The main indications I see driving this are the gerrymandering of political districts and the movement toward economic inequality. Zoning, neighborhood associations, wealth is separating us. Educated poor people will live in common. Uneducated poor people will not do that as much. The wealthy have separated themselves for a long time. Middle class people will do that as much as possible. “I am 62. We are the last generation to experience widespread economic growth. We are going to face problems in retirement and aging. This entry was posted in Responses and tagged Austin TX, Beloit College, Dave Lanham, demographics, mar making, Snap Kitchen, Whole Foods. Bookmark the permalink. Great reporting. Lanham is a singular man–poet, cartographer, musician–with a sharp eye for Austin’s advantages and apparent decay. Interesting piece on an old college acquaintance. That would be Beloit College though(not Benoit). Thanks – will fix typo.